At a PLAN-Boulder forum on the evening of May 7, 2012, a class of seven graduate students in the Urban and Regional Planning Program at the University of Colorado-Denver, along with their teacher, associate professor Bruce Goldstein, presented the results of their semester-long study of best practices for the siting of Housing First projects and also conducted a “World Café” process to collect answers from members of the forum’s audience to four questions relevant to the general topic. Housing First is a nation-wide initiative that places chronically homeless people in permanent housing and provides social services to them there. The class report, entitled “Emerging Best Practices in Siting Housing First,” was precipitated largely by the controversy over the proposal of the Boulder Housing Authority to build a Housing First project at the intersection of Lee Hill Road and North Broadway. Their study, however, did not include the Lee Hill Road proposal, nor did it address that dispute directly. Rather, the students—Dan Ben-Horin, Evan Carver, Matt Farrer, Dylan Grabowski, Annalisa McDaniel, Kara Silbernagle, and Phillip Supino—sought to discover a set of “best practices” from efforts to create Housing First projects in other cities. The students determined that although various prominent national organizations have been actively involved in promoting the Housing First initiative for close to two decades, very little material has been produced explaining the best ways to constructively engage neighboring communities and build support for Housing First projects. These “best practices” were what they tried to ascertain in their study. The cities which they examined were the two Portlands—Oregon and Maine, Denver, Minneapolis, Cleveland, and Worcester, Mass. Win Friends and Influence People—involve all stakeholders in the siting process and develop strong political support. Location, Location, Location—find the right place for the project. Go Slow to Go Fast—engage and collaborate with neighborhood groups as soon as possible in a transparent way, stick with the process as long as needed, and, if neighborhood groups do not exist, help create them. Maximize Face Time—work with politicians, community leaders and groups to select appropriate sites, collect design ideas and, after construction, create guidelines for the management of the project. Make New Friends but Keep the Old—enter into a non-binding “Good Neighbor Agreement” or a legally binding “Community Benefit Agreement” to ensure continuing support for the facility. What would enable you to support placing a Housing First facility in your own neighborhood? What roles should city planning and housing staff and City Council play in locating housing first facilities in Boulder? What criteria should be used when choosing a site to locate future Housing First facilities in Boulder? If you were the developer of a housing first facility in Boulder, how would you organize the siting process? 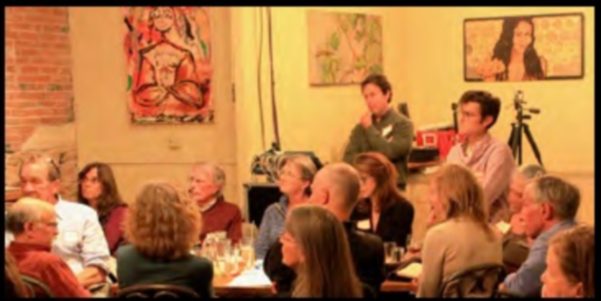 Subsequent to the PLAN-Boulder forum, conclusions from the discussions at each of the tables were posted on a website created by the class specifically as follow-up to the forum. Persistent themes from the discussions of all four questions seemed to be: that the site selection process should be credible, transparent, and objective, that facilities and services for the homeless and low-income should be dispersed throughout the city and not concentrated in any area, that a comprehensive city vision for dealing with homelessness should be developed as part of the Boulder Valley Comprehensive Plan and then followed before more facilities and programs are created, and that the community should have a role in setting the criteria for the selection of the Housing First residents. Besides the conclusions drawn from the World Café discussions, the website contains a copy of the Power Point slides used in the oral presentation, audio and video recordings of the presentation, and the class’s 57 page report, “Emerging Best Practices in Siting Housing First.” Anyone with an interest in Housing First programs around the country or in the Boulder Housing Authority’s proposed project in north Boulder should set aside some time to look at this impressive website. This reader, after pondering all 57 pages of the report, feels compelled to confess that he drew different lessons from the case studies than the graduate students did. To me, the main lesson which the studies teach is that finding the right site for a Housing First facility is the number one, two, three and four priority, and the number five (and last) priority would be allowing neighboring groups a sense of influence over the design and on-going management criteria of the facility. In Denver, neighborhood opposition was practically non-existent, because the Housing First project was incorporated into the old YMCA building at 16th Street and Broadway at the eastern edge of downtown. The neighborhood was used to dealing with transients, and its most pressing concern seemed to be that the historic façade of the old building was preserved. In Portland, Maine, the Housing First building was constructed on the site of a hobo campground on a dead end street some distance from the downtown area. Who wouldn’t have preferred the Housing First complex to the former use? In Worcester, the Housing First project, which was relatively small, utilized a vacant, defunct group home. In Portland, Oregon, the Housing First project was located near an historic “skid row” area. The neighborhood’s main concern seemed to be achieving a balance between residential and commercial uses and between the income levels of residents of any new housing. The Housing First developer seemed to obtain neighborhood acceptance by agreeing to build market-rate housing and (apparently) commercial spaces on half of the property it owned—with the Housing First building occupying the other half. In Cleveland, only one of the three Housing First proposals which were studied was actually constructed, and it was located in a deteriorated neighborhood which apparently welcomed the new Housing First project as an improvement and a source of needed jobs. Only in Minneapolis did the proposed location of the Housing First facility seem to be highly problematic. There the developer, a church-based organization, apparently mollified most of the more intense neighborhood opponents by agreeing to reduce the size of the project by about 15 percent and by negotiating a legally binding Community Benefits Agreement. I would readily admit that this summary of the case studies grossly simplifies them and neglects the many complexities that they explored. Nevertheless, valuable as this report is, after reflecting on its conclusions, I emerged with the feeling that they may have only limited application to Boulder, because our city simply lacks the kind of areas which could accommodate Housing First projects without provoking intense opposition from their current middle and upper-class residents. But don’t rely on my analysis. Read this useful material for yourself and reach your own conclusions! Thanks to Alan Boles for writing this article about my class’s presentation on Housing First! It’s a rich, thoughtful, and concise summary. Alan, you raise a few issues in the last couple paragraphs that I thought I’d add my thoughts on, in the interest of extending the excellent community conversation on this issue that we had at Shine. Three strategies have proven effective: 1) distribute Housing First sites throughout the region, as in Cleveland, so that no neighborhood can claim it bears an unequal burden; 2) concentrate services in low income areas with deteriorated infrastructure where the homeless are traditionally concentrated, as in Portland, Ore.; or 3) build facilities at an isolated site, as in Portland, Maine, so that the perceived impact is lessened. As you note, the proposed location of Boulder’s 1175 Lee Hill project meets none of these criteria. You suggest that the second and third would be tough to achieve in Boulder. I agree that we don’t have a “skid row” in Boulder, although we do have potential building sites that are more isolated from residential neighborhoods like Holiday and Dakota Ridge, especially in eastern Boulder. More importantly, I think we cannot ignore the first criteria, distributional fairness, given the location of the homeless shelter next to the proposed 1175 facility, and North Boulder’s other social service facilities and a very high percentage of affordable housing due to the off-site provisions of our inclusionary housing ordinance, which has promotes concentration in communities with lower property values. Boulder is certainly capable of a more equitable distribution of housing and facilities that impose local costs and provide city-wide benefits, as well as a fairer distribution of city-funded benefits like parks, libraries, etc. The other point I’d like to raise is the sense I get from your review that you don’t feel that public engagement in other cities was that consequential, and don’t feel it would be worth bothering with in Boulder, since our homogenously affluent population will fight a homeless facility regardless of how they are engaged. I disagree with this – I feel that this is the kind of thinking that motivated Boulder Housing Partners stealthy approach to siting this facility, which led to 8 months of bitter controversy. In 5 out of the 6 cities my students examined, the Housing First developer made a multi-year effort to build a broad-based community coalition, provide comprehensive and timely information in a transparent fashion, and commit to good-faith negotiation with local residents of all income levels. These steps had three important outcomes. First, in some of the cases the developer was able to conclude that community opposition to the site was too substantial to justify pursuing the site BEFORE making a major commitment to build, a possibility that Boulder Housing Partners denied itself by purchasing the 1175 property, aligning financial support, and drawing up architectural plans before informing the community of their intentions. Second, as you note, public engagement enabled developers to design their facilities to meet multiple needs in addition to those of the chronically homeless, including local economic development, environmental protection, and commercial use. Thirdly, and most importantly, extensive public engagement in other cities my students examined enabled site developers to better integrate these facilities into their neighborhoods, and build social and political capital for future efforts to support the homeless. Public involvement fed a virtuous cycle, with each facility making the next one more feasible and less controversial. In contrast, my sense is that Boulder’s experience with the 1175 Lee Hill project was contentious and dispiriting. Its legacy is a divided community in North Boulder and across the city as a whole, questions about whether Boulder Housing Partners has too much autonomy from the city, and a reduction in the legitimacy of the “in right” permitting process that the city council created after the last controversy over homeless housing in the early 2000’s. So I think we need to reconsider the idea that Boulder is an exception to the best practices that other cities have developed in siting Housing First facilities, as well as other locally unwanted but civicly desired landuses. To my mind, the 1175 Lee Hill siting process was self-defeating, since victory alienated many of the people who will be called on to provide political and financial support for future progressive projects and policies, from support to the homeless to the carbon tax. The fact that we have an engaged middle and upper-class population means that we need to try harder at public participation and collaborative governance, not resort to cynical facility siting strategies that ignore local concerns.